Thank you for letting me unload yesterday. I wasn't planning on it, but I woke up at 3:00am that day, and it all just poured out. BTW, Luca is fine now. Thanks so much for your concern. Today, I am happy to report great news! If you follow me on Facebook, you might be aware of the scoop, but this is my first opportunity to blog about it, and boy am I excited to have fancy new photos by Lauren Rubinstein to show you! (BTW, her website is mouth watering. Please click over to take a peek at her incredible talent. AND, we just discovered that we both have roots in Minnetonka, MN, so I'm especially fond of my new friend:). 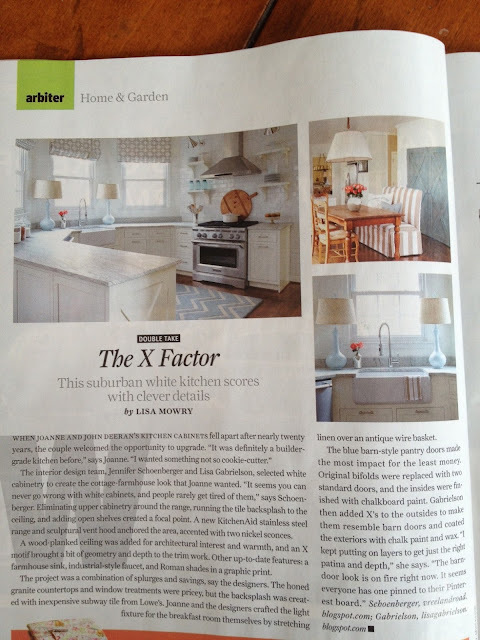 Christmas came early this year, with a milestone publication of a recent project in Atlanta Magazine!! The newsstands should be stocking the January issue any day now, but hurry if you want one, because I will be scooping up all of the Johns Creek issues, for sure! The one page spread, scouted and edited by Lisa Mowry (...the most generous editor on the planet. Look her up if you are interested in publishing your work. 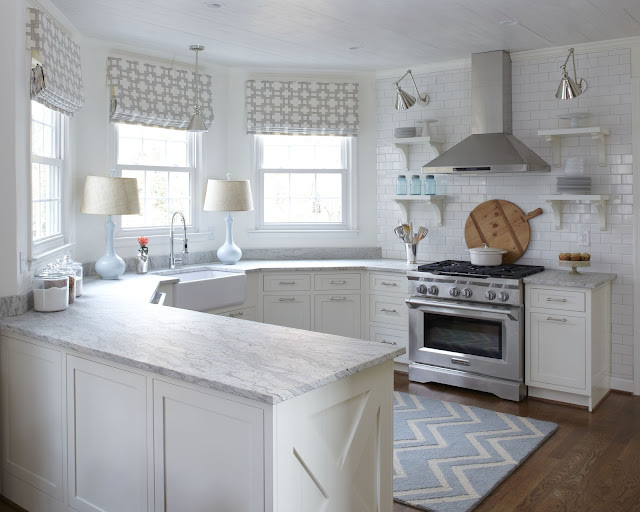 ), and photographed by Lauren Rubinstein, features the newly renovated Deeran kitchen. Joanne and John are friends and neighbors of mine, and when they approached me to see if I knew of someone who could help them design a new kitchen, I jumped at the chance to bid on the job. I had just taken on a new partner, Jennifer Schoenberger, and was sure we could give Joanne the look she lusted after. 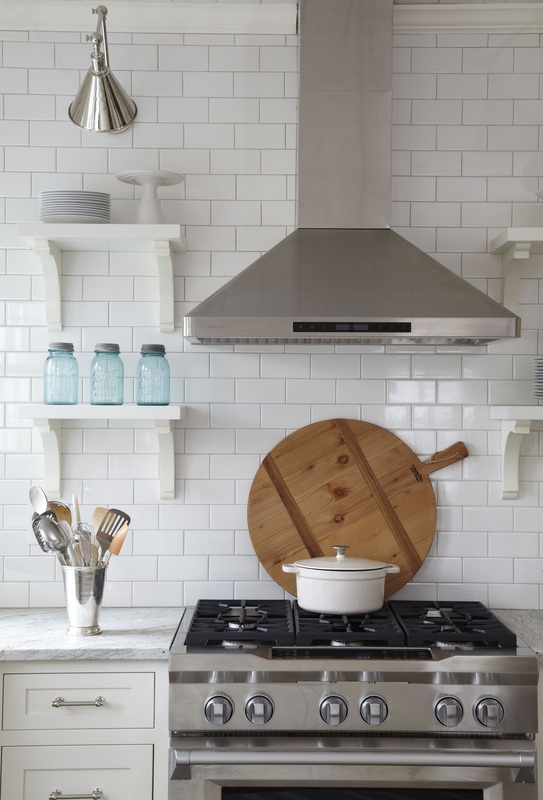 Incidentally, the inspiration kitchen she found on HGTV was designed by our friends, Julie and Anisa of Milk and Honey Home. It's a small world here in Atlanta (if you don't count the 5M inhabitants:). The Deeran's previous kitchen was green-gold, black and white, and the builder grade cabinets circa '91 were showing their age (believe me, I know since I have some myself). Joanne wanted white, light and bright with open shelving, easy to care for surfaces, updated appliances and expanded storage. 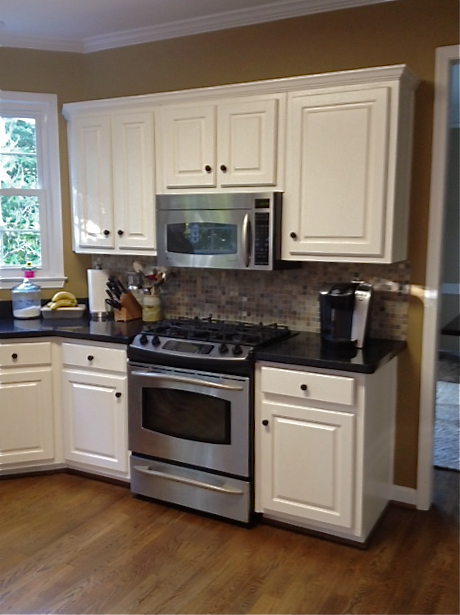 She is a master cook, and frequent entertainer, and wanted her kitchen to be functional for her daily needs. The transformation was radical! 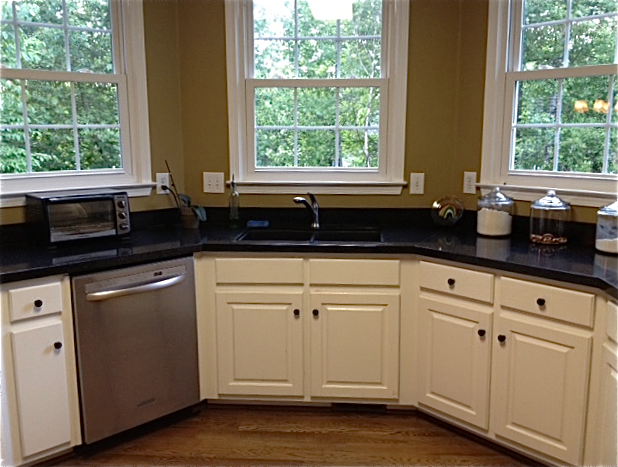 We kept the footprint of the kitchen, but removed the upper cabinets to allow for air flow and pretty, functional display. 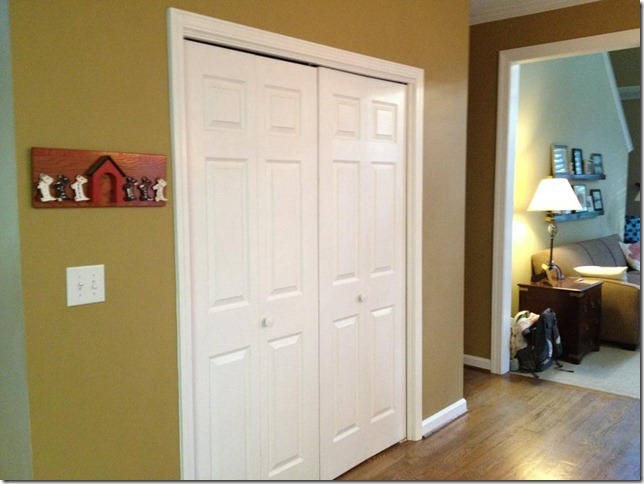 All cabinets are custom built by my favorite carpenters in Cartersville, GA, with soft close drawers and slide out shelves for fancy storage. The custom Roman shades by Susan in Thom Felicia's City Squares adds a pop of pattern and color, as does the chevron rug from Target. (150.00, folks!). We planked and whitewashed the ceiling, added new can lighting and sleek Circa Lighting polished nickel sconces for bling, and installed yummy honed granite that looks like marble. Joanne knew she wanted a farmhouse sink; a staple ingredient in the urban cottage kitchen. Back when we were designing her dining room, Joanne found these awesome vintage gourd lights for a song at the booth across from mine at the Queen of Hearts Antiques and Interiors in Alpharetta. She sprayed them a beautiful powder blue, and topped them with Pottery Barn raffia shades for texture. 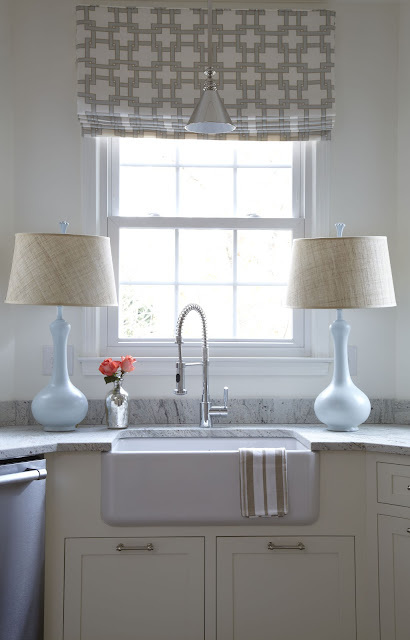 I am always a fan of lamps on the kitchen counter for warm lighting and ambiance. Subway tile to the ceiling from Lowes. New Kitchen Aid range and vented hood. Restoration Hardware Lungarno pulls (my nod to Florence;), custom shelves and Home Depot brackets. John and Joanne were frustrated by the hard to reach shelving and dated bifold doors in the above pantry. We enlarged the opening, and replaced the doors with custom built barn doors with X motif to match the island. With a new custom bench in Sunbrella Sand Stripe, their old pine farmhouse table and French chairs were given a new lustre. Although the above pendant was in the original design plan, it was WAY above budget. Joanne was lucky to find the cotton basket frame at the Queen of Hearts (so many goodies there guys! ), and we commissioned my buddy Cherilyn to sew the burlap cover and stitch it with twine. 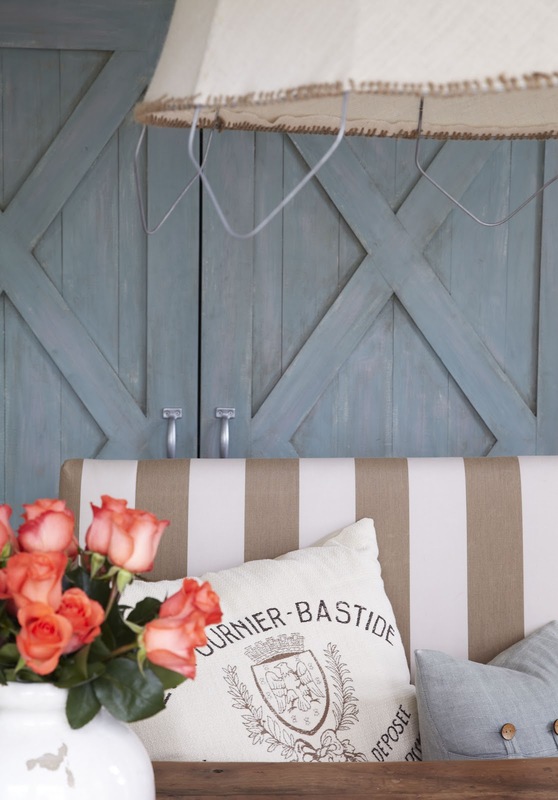 Joanne found an electrician to customize the innards, and to seal the deal, she scored this antique fisherman's rope back home in Long Island. In the end, we got the same high end look for 1/5 of the price! If there's a will, there's a way....always my motto. Saving the best for last. Lauren actually took this shot from outside the house to get the perfect vantage point. Here you see the closeup patina of the blue green barn doors. I am an antique dealer, as well as designer, and I do A LOT of painting and furniture restoration. I try to incorporate an original painted piece in every one of my projects for that one-of-a-kind look every home needs. The doors are new pine, but with the help of multiple layers of chalk paint in Old White, Paris Gray and Duck Egg, and lots of dark wax, I was able to give them the perfect patina of age. The pillows are from my family room, brought in to style the shoot. I found the French pillow at TJ Maxx and the blue silk button pillow is from Italy. Thanks to Annette Joseph for the idea of coral flowers for editorial punch. I hope to someday work with this extraordinary talent. Most of all, thank you John and Joanne for trusting us with this important project. It was a joy to work with you, as always. Such EASY clients!!! I am grateful for the opportunity, but even more grateful for our friendship. I am off to get ready for Mom and Dad's visit...clean the house, take a shower, grochery shop, wrap the presents...only 5 more hours 'till they reach Atlanta. Wish me luck;). Apologies for my absence in blog land. Thank you so much to all of you who have found me and decided to dedicate some time to hear what I have to say. I am not a particularly political, or religious person for that matter. I sway further to the left than most family, friends and neighbors, and tend to keep my opinions close to the vest. This week, though, has moved me. Rocked me to the core. I know I am not alone. The horrific murders in Newtown have stopped many in their tracks. There is no way to make sense of it all, but it is clear that the time has come to put a stop to all of the madness. The President was right when he said that these children and educators have inspired us as a nation. I have never written to my congressman before, but have been inspired to voice my opinion on gun control, and sign petitions. My dad has been inspired to rally his friends and community and two days ago, handed over his gun to the South Walton Police Department. It is time to say ENOUGH. Yesterday, my son was repeatedly kicked and head-butted for telling a school mate that he should not eat on the bus. When asked by an administrator why he was doing this to Luca, the boy said he could not CONTROL himself. Granted, the child has social issues, but is it wrong of me to want to march to his parent's house to ask if they have firearms? The recent events have driven us to paranoia, which feels far worse than 911 since it touches our children and violates their safety. When Luca asked me this past week why I was crying so much (not something he witnesses often), I told him that it's because I am profoundly sorry for the children and teachers, for their families, for our own children and our nation. Have we come too far to turn it around? I hope not. Last Friday marked the first day of my Christmas break. I had already decided to take some time off to dedicate to the family after a very busy year of trying to make a living and building my business. The angel children have indeed inspired me to be a better parent. To slow down and take time for what is most dear to me. In lieu of an advent calendar, I started a new tradition: The 12 Days of Christmas. We have had fun with these small daily surprises, which range from 10 minute back rubs, to planning their favorite menu (Wouldn't you know Luca asked for lobster? He is settling for ribs.) ,and scavenger hunts to the freezer for their favorite ice cream. My daughter pointed out that most of these surprises have been about food. I guess that's just a mother's way of taking care of her babies and showing how much she loves them. Although they are 15 and 11, this week they feel like babies, indeed. Merry Christmas. Love to all.